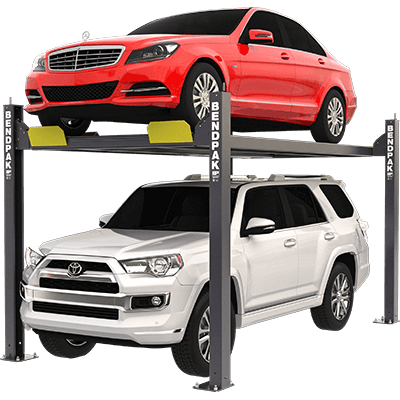 BendPak specializes in small garage and industrial parking solutions, so our parking lifts are suitable in both commercial shops and home garages. 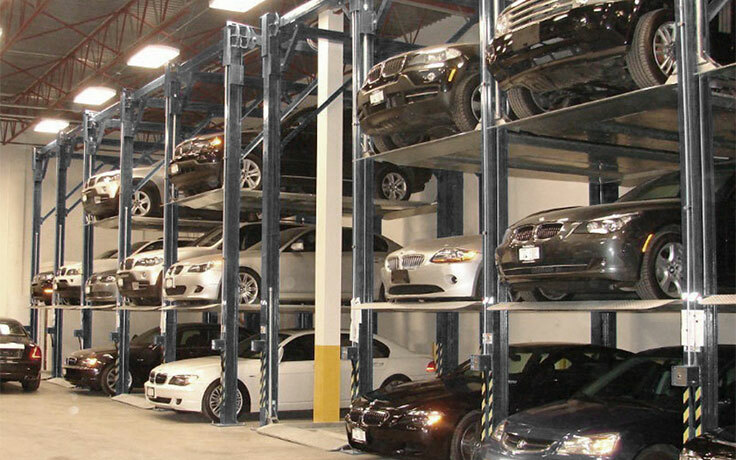 Our strength as a leader in the parking lift industry assures that we provide the highest quality, most technically advanced car parking solutions to our customers. The integrity of our parking lifts, evidenced by the thousands of systems installed worldwide, has remained a constant characteristic of our products. 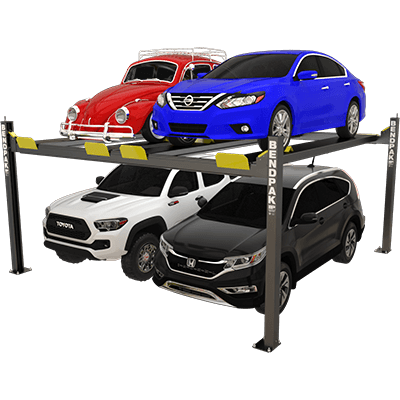 Whether you're the owner of a public parking structure or just want to get the most storage out of your private carport or garage, BendPak has a selection of premium parking lifts to truly maximize your work space. We offer double-stacking two-post and triple-stacking four-post configurations, all with the smallest footprints possible. Double-wide lifts are also available, offering incredible parking ability in a compact design. 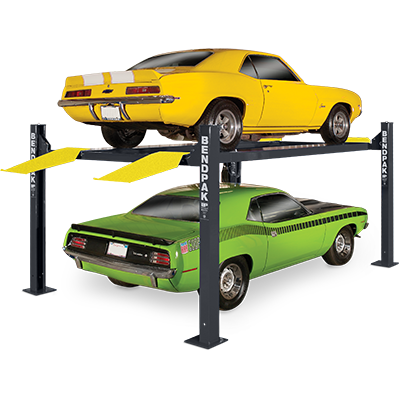 As with every BendPak product, safety and durability are our primary concern, so these rugged, compact parking lifts feature automatically engaging spring-actuated locks, plenty of hard-working muscle for busy garages, and ergonomic operator controls for superior ease-of use. Starting at $9490 + FREE SHIPPING! Starting at $5950 + FREE SHIPPING! Starting at $6450 + FREE SHIPPING! Starting at $4250 + FREE SHIPPING! Starting at $5350 + FREE SHIPPING! Starting at $5750 + FREE SHIPPING! This 6,000-lb. 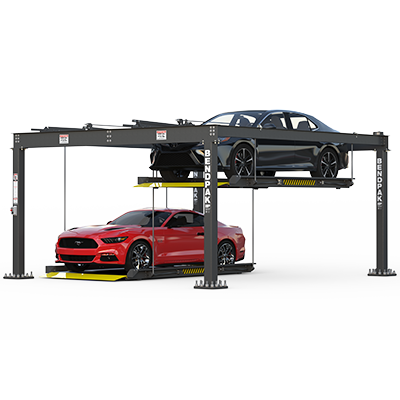 capacity double-wide parking lift, available in standard and extended-length models, safely converts your two-car garage into a four-car garage. No columns sit between the two parking platforms, which keeps this tandem lift’s footprint down to an admirably compact 205” overall width. Starting at $16090 + FREE SHIPPING! Starting at $22945 + FREE SHIPPING! Starting at $24130 + FREE SHIPPING! Starting at $32410 + FREE SHIPPING! 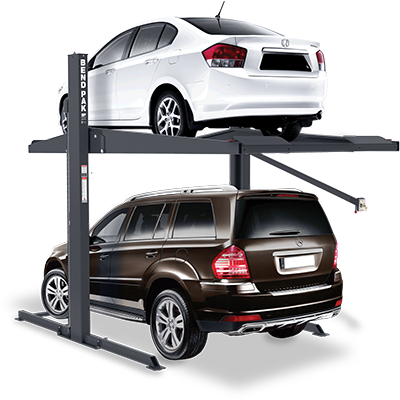 The HD-7 Series parking lifts are ideal for the average home garage, which also means one or more units will easily fit in commercial shops. 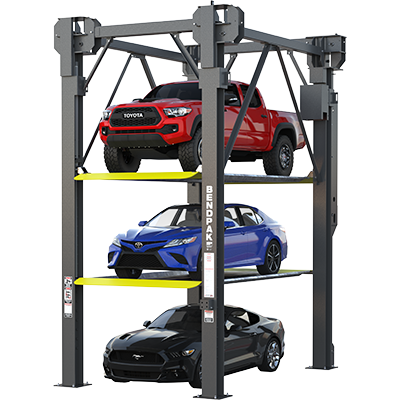 These parking lifts will hold many light trucks and SUVs, and their approach ramps are also well-suited for low-profile cars. Starting at $3510 + FREE SHIPPING! 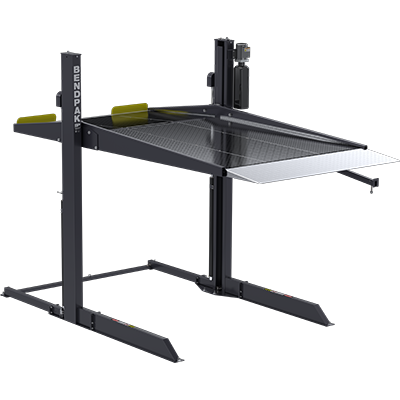 If you need more lift capacity than the HD-7 series offers, the HD-9 features 9,000 lbs. of lift. 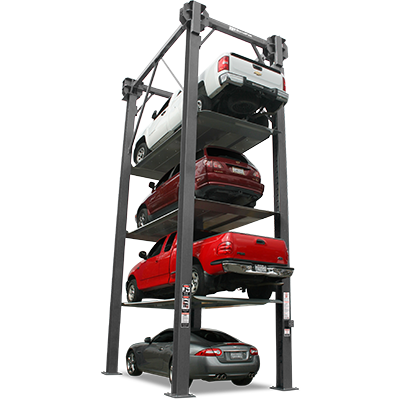 This parking lift is one of the highest-selling we make for a reason: 9,000 lbs. is enough to cover light-duty trucks and SUVs, and the unit fits in the average parking space. Starting at $3355 + FREE SHIPPING! The HD-9XL is your 9,000-lb. 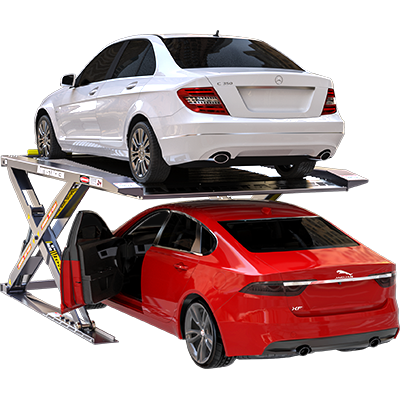 capacity rugged lifting solution when you need to lift a car or truck with a longer wheelbase. 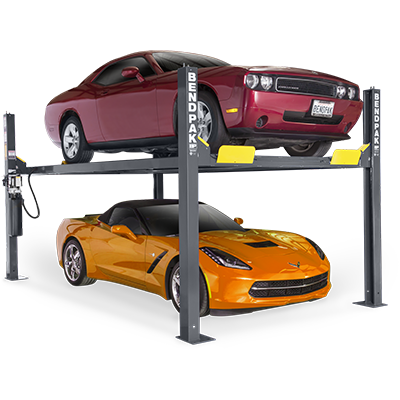 At 188”, the runways on this four-post parking lift are two feet longer than the ones on our standard-length HD-9. Starting at $3430 + FREE SHIPPING! 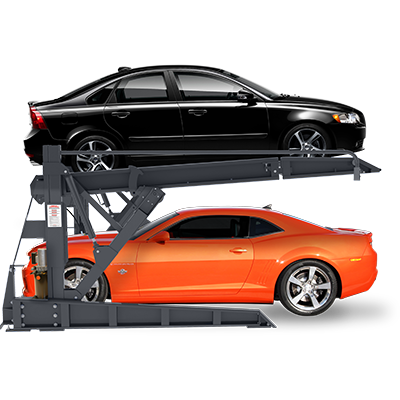 The super-wide HD-9SW is a parking lift that stores two vehicles side-by-side. With 192” between the posts, this parking lift is wide enough to clear two vehicles underneath and two on the ramps above. Keep your vehicles loaded while you add an optional caster kit for full mobility. Starting at $7385 + FREE SHIPPING! 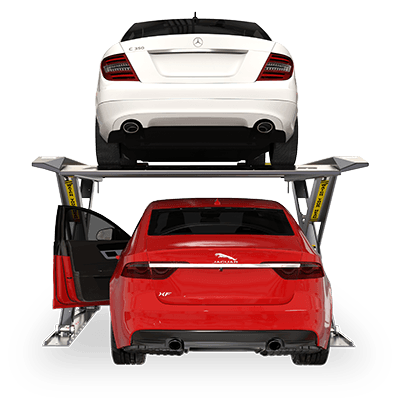 Never Satisfied with "Good Enough"
We make it our business to not only build the best car lifts, but to keep improving them. Our parking lift features are constantly being copied by other manufacturers who try to keep their costs down by not bothering to do their own engineering. On the other hand, we've spent decades building a solid reputation and relationship with our cherished clients, and we refuse to do anything to jeopardize that. Our commitment to servicing our customers has been an important factor in our success, and it will continue to set us apart from our competitors now and in the future. 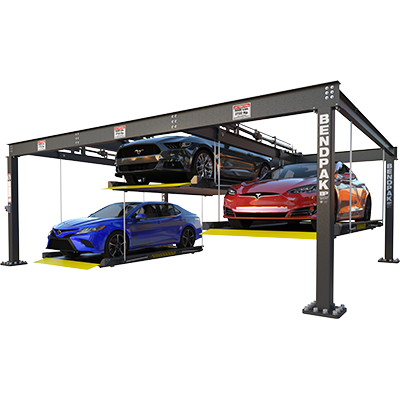 BendPak's experience in providing property owners, developers, designers and contractors with amazing parking lifts has enabled us to develop innovative and cost-effective solutions to meet all your vehicle storage needs. Whether you plan on installing surface mount or free-standing parking lifts, indoors or out, you can rely on our expertise to provide the best lifts that money can buy.